Below is an excellent article by Tom Allard that appeared in the Sydney Morning Herald on 24.1.2016, which exposes the hypocrisy of the Australian Government on the issue of the maritime border between Timor-Leste and Australia. It is very obvious that the change of the Coalition’s leadership means that there will be no change in Australia’s callous and hard-nosed attitude in refusing to accept the UN Convention of the Law of the Sea (UNCLOS) between Australia and Timor-Leste. The article reports on a speech made in Washington DC by Australia’s new PM, Malcom Turnbull (see below). The speech was obviously intended to show support for US concern about China’s position on maritime boundaries in the South China Sea – being as ever compliant with US Military Industrial Complex policies and behaviours in the world. In doing so, he chastised the US for not being a signatory to UNCLOS. This is rather rich coming from the leader of a nation that has signed the Convention but refuses to comply with it and refuses to recognise it in relation to Timor-Leste, the poorest nation in our region. What it means is that Australia gets the benefit of billions of dollars worth of oil and gas coming from Timor’s half of the Timor Sea and is taking this from a newly independent nation that was occupied for 24 years by the Indonesian military as it committed crimes against the people that were every bit as serious as those committed by the Nazis during World War 2. Turnbull obviously pulled out all stops to impress his audience as he quoted Thucydides, the ancient Greek historian about the history of how the ambassadors of the Athens city state rebuffed the leaders of the island of Melos, who wished to remain neutral in a conflict that was engulfing the ancient Hellenic world. All very eloquent and impressive. Or is it? I think it is interesting how conservative politicians try to avert us from facing the truth and stop us from weighing up the ethics of dubious positions taken by them on current political issues by referring to events in ancient history. We have seen this before when politicians did not want to face the truth. The hypocrisy is worse when it is recalled that Australia went along with Indonesia’s brutal occupation of Timor-Leste until after the 1999 independence referendum and that it recognises the UNCLOS maritime principle in its relations with NZ and the Solomon Islands. One wonders if Turnbull and his colleagues believe that Timor-Leste has to be punished for its struggle to be independent. Certainly their position on this issue is a disgrace – especially given the brutality that the East Timorese suffered because they supported Australian soldiers during World War 2. Sadly, the ALP is little better. It had two terms of government during which the Rudd/Gillard governments could have reversed this decision but didn’t. It was not an oversight as some might think because AETFA SA had lobbied with ALP MPs on this issue for some time. Anyway, congratulations must go to Tom Allard for his excellent article and its analysis. Those Australians who really do care about human rights, social justice and fairness between nations must all work together to change Coalition and ALP policy that sees us stealing valuable resources from a friendly people who have done much for Australia. We helped change Australia’s shameful policy in attempting to stifle Timor-Leste’s just struggle for independence and we can help change yet another shameful and unfair policy towards our valiant World War 2 allies – the East Timorese. 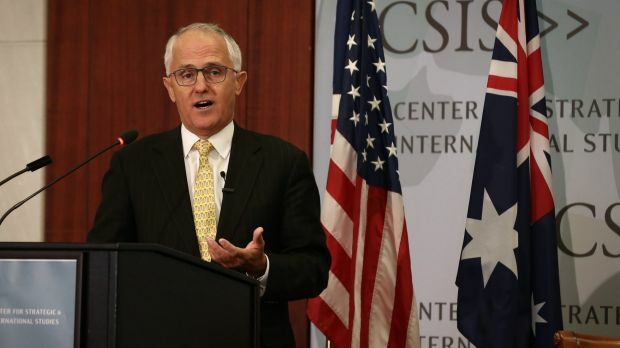 Malcolm Turnbull’s keynote speech in Washington DC last week, the first serious articulation of his foreign affairs stance since becoming prime minister, gained plenty of plaudits on both sides of the Pacific. Turnbull was insightful and eloquent, quoting the ancient Greek historian Thucydides as he traversed the great geopolitical challenges of our times. He was also breathtakingly hypocritical. Musing on the rise of China, its territorial ambitions in the South China Sea and the resulting tensions with the United States and its allies, Turnbull made an impassioned plea for nation states to embrace the rules-based international order. This order – based on the United Nations, multilateralism and respect for international law – was “possibly the biggest story of modern times”. It had, he intoned, “delivered the greatest run of peace and prosperity this planet has ever known”. “Differences should be resolved by international law,” he said, citing the deliberations in the Hague under the UN Convention of the Law of the Sea (UNCLOS) to settle a dispute between the Philippines and China over a 200 nautical mile portion of the South China Sea rich in oil and gas. So far, so – apparently – uncontroversial. Except that Australia itself does not adhere to international law when it comes to maritime boundary disputes. In 2002, after negotiating a temporary boundary with the transitional administration in East Timor that hugely favoured Australia and placed the bulk of oil and gas reserves within its territory, Australia quietly withdrew from the jurisdiction of UNCLOS. The reason was obvious. It had negotiated a deal with an impoverished, war-ravaged and fledgling state that was so unfair it would not stand up to challenge under international law. If the boundary was drawn midway between East Timor and Australia – as is standard under international law – most of the oil and gas reserves would lie within Timor’s territory. During later negotiations over sharing the oil and gas reserves – worth between $40 billion and $100 billion – Australia infamously bugged East Timor’s negotiating team. East Timor got a better deal but not anything approaching its rightful share. East Timor is still fighting for a permanent, equidistant boundary and a better share of the oil and gas reserves. The Coalition government – despite being rebuked by the International Court of Justice for its espionage – is refusing to enter talks and won’t allow the independent arbiter in the UNCLOS Tribunal make a determination. Australia may have ratified UNCLOS but it has cynically recused itself from being subject to its jurisdiction. Turnbull’s reproach of the US about “diminished leadership” applies equally to Australia. Why would China, the US or any country heed Turnbull’s urgings for the potential explosive disputes in the South China Sea to be settled by international law when Australia won’t do likewise? In his Washington speech, Turnbull quoted Book 5 of Thucydides history describing how the ambassadors of the powerful city state of Athens rebuffed the leaders of the island of Melos, who wished to remain neutral in the conflict engulfing the ancient Hellenic world. The ambassadors told the Melians that “justice is to be found only as between equals in power. As for the rest, the strong do as they will and the weak suffer as they must”. Yet the ignoble treatment of East Timor since its independence means Australia is acting just like the Athenians. For East Timor’s former president and prime minister Xanana Gusmao, Australia’s conduct recalls the British statesman Lord Palmerston’s famous maxim “Nations have no permanent friends or allies, they only have permanent interests”. “This is the mindset of powerful nations when they deal with small countries like ours,” Gusmao said last year. To be fair, it seems Turnbull has not focused on East Timor or the maritime boundary dispute since becoming prime minister. He has had plenty on his plate. He most likely unknowingly betrayed Australia’s foreign policy hypocrisy in Washington. This year, he should switch his gaze to the near north. Turnbull has an opportunity to end Australia’s diplomatic double standard and begin a meaningful negotiation with East Timor’s government over the boundary. This is in our national interest. This entry was posted in Uncategorized on January 27, 2016 by bohan.